A 42-space Camper Park located on the north side of campus offers continuing undergraduate and graduate students a unique campus housing option. Students live in single-occupant recreational vehicles and share a community building with restrooms, showers, laundry facilities, and a lounge/study room. Living at the park is similar to living in a campground. Individual trailers have a sleeping area with table and a kitchenette with electricity and propane. The community building has a kitchen and outdoor grill area for cooking and picnic tables where residents often gather to have communal dinners and potlucks. Most trailers do not have a bathroom or sewer connection, so residents use the communal facilities. Greywater tanks are connected to the kitchen sinks and residents must empty their tanks in the nearby greywater drainage system. The university provides portable electric heaters for heat. The Camper Park receives no direct Ethernet service. Residents may utilize USB WiFi extenders to attempt to receive wireless service, though signal strength does vary and is impacted by the natural environment. If having a consistent internet connection with reliable service within your campus residence is important to you, or for the academic work that you are engaged in, then the Camper Park is not an appropriate choice for you. One storage unit is provided for each space and residents may not bring additional storage units. The park is currently transitioning from student-owned vehicles to ones owned and maintained by the university. 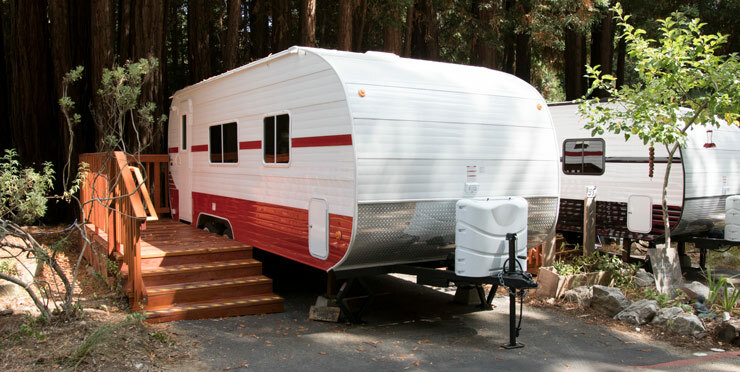 Current residents who own their trailers, and who maintain their eligibility and maintain their units to appropriate standards, may continue to live in their own vehicles or may choose to remove their vehicle from the park and live in a university-owned vehicle, subject to availability. Student-owned vehicles are not eligible to be sold to other students for the purpose of remaining in the park; student-owned vehicles must be removed from the park as students graduate or otherwise separate from the university, or choose to move out of the park. As spaces become available the university will install university-owned vehicles and assign them to interested students. Continuing undergraduate and graduate students are eligible to apply. Newly admitted transfer students and graduate students are not eligible during their first quarter at UCSC; newly admitted freshmen are not eligible during their first year at UCSC. Academic year and quarter breaks only. Student is liable for any loss or damage to personal property. Student is advised to obtain personal property insurance. Electricity, water, and a limited amount of propane included. Eight of 42 spaces include a sewer connection; all others have greywater tanks and resident is responsible for emptying as needed. Student submits maintenance requests (fixit.ucsc.edu) and university staff perform necessary repairs and maintenance.